Registrants can choose to have their number mailed if registered by May 31. If purchased after May 31, registrant will need to attend the Peachtree Health & Fitness Expo to pick up race number. Cost: The special entries are $200 each, $165 of which is tax deductible and will go directly to the Kilometer Kids program. These entries are only available to those not already registered for this year's event. 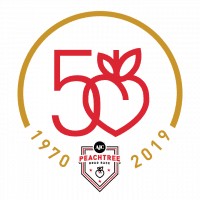 March 15 - 31 - NEW REGISTRATION DATES IN 2019 - AJC Peachtree Road Race registration for Atlanta Track Club members & AJC Peachtree Road Race Lottery. Click here for 2018 AJC Peachtree Road Race results. The AJC Peachtree Road Race starts in Buckhead near Lenox Square Mall and ends in Piedmont Park.